There used to be a time when if you wanted an upmarket 410 you had to spend some serious money and buy what essentially was a scaled down version of one of the big name smoothbores. If not, you more or less had to make do with something old or a sub-gauge shotgun that had all the grace of a poker. Well things have changed and all for the better, the gunmakers of Turkey seemingly becoming the absolute masters of quality 410’s at a price that can hardly be comprehended, the Khan K226 Arthemis being a significant example of these eastern European abilities. Khan is a sister company to Armsan who manufacture some of the best and most affordable semi-autos on the market, and is now part and parcel of Viking Arm’s updated portfolio. Manufacturing quite a large range of shotguns of all styles and suitable for every need from their factory in Istanbul, the Arthemis range is more or less central in terms of looks, style and variety, although for some reason Khan’s website doesn’t actually list this particular 410 model within the K226 range although - as you can see - here it is! What you get for your money is exactly what you need and that is an attractive little 410 and nothing else, although for the exact same £499 you can also get the multi-choked version. 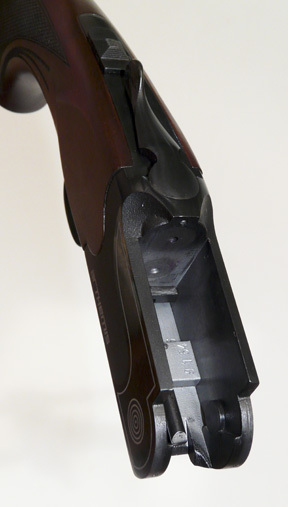 That said, the fixed choke is restricted to full and a tight ¾, ideal for these diminutive cartridges. 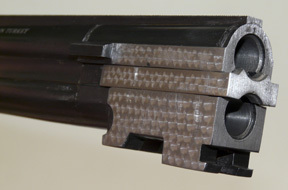 Finished in a dark, rich, semi-oiled treatment the woodwork is enhanced by the rather distinct, open chequering on both the pistol-grip and narrow Schnabel style forend. This in turn is complimented by clear cut striations and a gentle palm swell to the right side of the slim, nicely radiused grip. The wood itself, whilst not outstanding, is well grained with the stock finished off with a well fitted soft rubber recoil pad with a hard insert on the heel. The 28” mono-bloc barrels are very nicely blacked and come complete with vented top and mid-ribs, a small brass bead and more importantly swage into useful 3” chambers. Feeding into a mechanical boxlock action that has obvious Italianate influences, what little ornamentation there is is both tasteful and distinguished. Drawing from Khan’s Duotone designs, the black action combines matte panels to both sides with gloss finished inserts that extend around the base with stippling around the fences. In turn a white edging and a bull’s eye design on the hinges and silvered lettering all make for a subtle take on a modernistic theme. 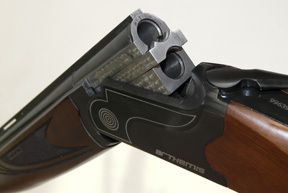 Both top and bottom tangs are short, as is the top lever, although the manual safety and barrel selector is broad and easy to locate even when wearing gloves. One item that could possibly benefit from enlargement it the trigger guard, this small almost circular item whilst more than sufficient to protect the narrow gold plated trigger is physically a fraction undersized for all but the smallest, slimmest of fingers. On the whole though this little Khan Arthemis is an attractive little shotgun exhibiting looks and a quality of finish normally associated with 410’s costing considerably more. Similarly the Italian mechanical influence, Khan having taken a time proven design and injected the ruggedness the Turks expect of their down to earth working smoothbores, a characteristic all to the benefit of the test gun. Unlike the Americans who shoot 410’s with a passion, us Brits tend to regard this smallest of gauges as one to move away from as soon as possible, a calibre that one serves one’s apprenticeship with before moving onto a 20 or 12 gauge. However, Khan’s Arthemis could just be the shotgun to change all that. Weighing in at 5lbs 4oz with a point of balance a half inch in front of the hinges, the Arthemis absolutely leaps into the hands, the 28” barrels the only part of the gun that stops it almost blowing away. Size wise the Arthemis has a drop at comb and heel of 1 7/16” and 2 5/16” which for me meant it shot slightly high combined with a fractionally short 14 1/8” length of pull whilst a tad more cast would be beneficial. But with the mount adjusted so to give a flat view along the 7mm cross-cut rib things improved somewhat. The one point that would benefit from some minor attention is the trigger, the 7lbs 6oz release weight being a tad heavy for such a lightweight shotgun. However unlike many 410’s, there’s no trigger creep whilst the mechanical mechanism is more than crisp enough so as to allow a fair degree of predictability. Loaded up with a selection of Lyalvale Express 2½” and 3” cartridges and shot first around some of Bond & Bywaters sporting targets and then around a friend’s estate on a couple of late evening roost shoots, the little Arthemis more than proved its worth. 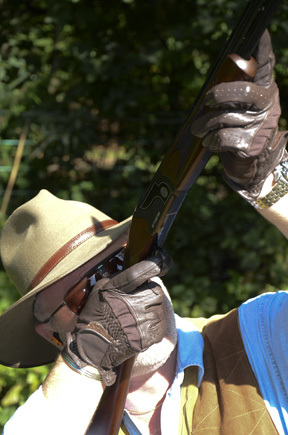 Used in many ways as both a shotgun and rifle, the general format of the gun allows for each type of shooting be it a moving target or one settled high in the branches above. 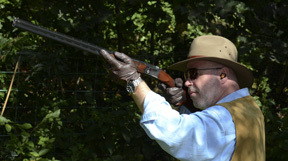 With the tight fixed choking, once you’ve mastered the sight picture required of this Khan the birds will start falling, even the larger rounds producing nothing more than a pop and a small bang before the recoil free results are seen. What you have to take care of is the speed with which the Arthemis swings. 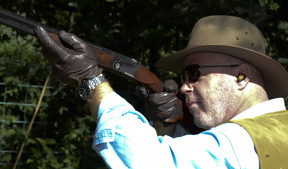 Since in shotgun terms there’s hardly anything to it, there’s no effort required to make the gun do exactly what you want but do beware, if you’re not careful you’ll find that you swung the muzzles way beyond their intended lead, the barrels virtually scampering along, the narrow forend playing no small part in this fingertip control process. Once you’ve mastered this little shotgun’s requirements and traits it genuinely becomes an absolute delight to use. As a first shotgun for a small boy or girl, a vermin exterminator, an ultra-light carry everywhere sub-gauge, a working tool or just a regular companion when out walking either with the dogs or a quiet few moments beneath a few roost trees, Khan’s little 410 Arthemis truly can’t be beaten. Let’s face it, at £499 it’s almost for nothing, yet is a genuine pleasure to shoot and basically be out and about with. It only costs a fraction more than it weighs, the handling is lightning quick and with 3” chambers and some hard hitting ammo such as those by Express, if you’ve never tried a 410 such as the Arthemis you’ll be stunned by this small shotgun’s ability to perform. When you combine the asking price and abilities together, like the other shotguns within this conglomerate of Turkish gunmakers, it’s more or less an impossibility to come up with a negative. This really is a great little shotgun and one that’ll give you years of pleasure especially when you look back and consider just how little you paid for it.